2 to 4 Copies: $22 per copy – 12% off. 5 to 9 Copies: $20 per copy – 20% off. 10 to 19 Copies: $15 per copy – 40% off. 20 or more $12.50 per copy – 50% off. The best motivation book for athletes just got better. For the third edition, we’ve added 75 more motivation quotes and a dozen more inspirational stories and coaching bullet lists for peak performance. Read the list of all 10 chapters here. Read all of Chapter 3 titled “Release Your Mental Emergency Brake” here. • Over 120 of the greatest sports motivational quotes ever assembled. 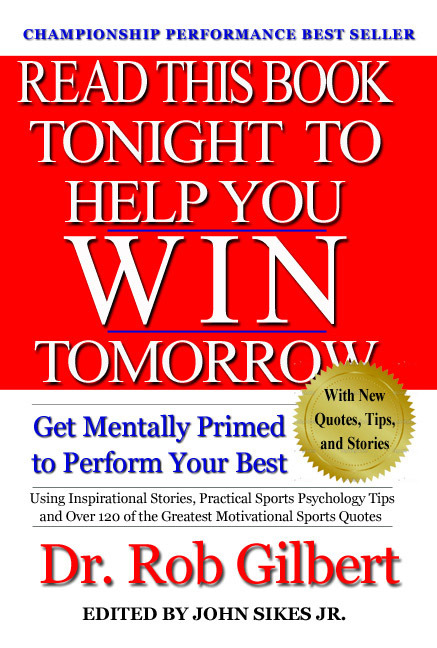 • 40 power statements to read on game day to perform your best when the pressure is on. • Alleviate the pressure of “must win” situations. • Why the best athlete never wins. • What the greatest upset in sports history teaches about never giving up. • Overcoming competitive fears, nerves and doubts. • The simple mantra that helps athletes block out distractions. • 5 must have rules for going all out. • Striking the right balance between caring too much and caring too little about your performance. • Proven methods to loosen up and play your best. • Decision vs. action. Why athletes must know the difference to perform at a higher level. • What the story of David and Goliath can teach athletes about confidence. • Tommy Lasorda’s secret weapon to help athletes win. • How focusing on effort instead of outcome boosts performance. ability including what it means to be a team leader and playing out of your mind. • Eliminate the 14 killer words that destroy performance.